Frilly and Funkie's new challenge "By the Sea"and I knew this was the time. Thanks again Linda for the fun little extras! After choosing my card base and base layer, I followed with a pretty layer which I ran Viva Crackling Cream through a stencil from Folk Art for a crackling effect. After it dried, the next layer is Tim Holtz Sizzix Thinlits Mixed Media Die. I then began to build the layers again doing the same process. I added cheesecloth for some texture. The sweet image is from Frilly and Funkie which I adhered onto a Jaded Blossom Luggage Tag Die. Up, Up and Away stamp set. I embossed it with fantasy silver from Sweet Stamps. The butterflies are Jaded Blossoms Spring Dies 2 and embossed in shabby blue enamel embossing powder. WOW Sherrie, this is absolutely beautiful! Wow..........wow!!!!!!! I'm speechless, this is incredible!!!! This is gorgeous! LOVING the colors, the boat image and the mesh material!!!!!!!!!!!!!!!!!!!! Absolutely beautiful Sherrie. 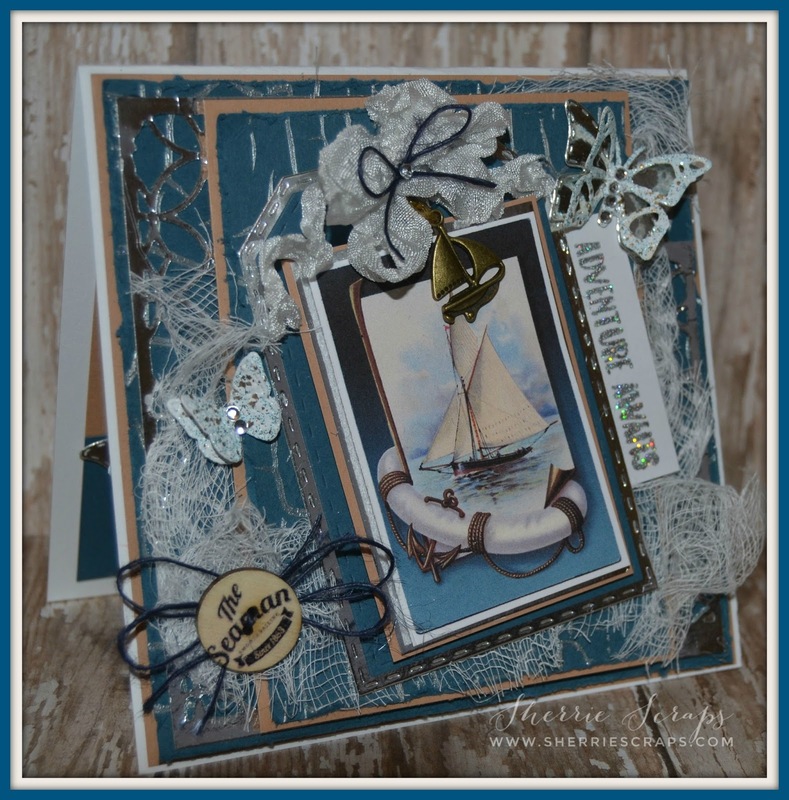 Love the picture of the sailboat and all the embellishments. Love it my friend. Oh my goodness, Sherrie, this is a nautical masterpiece!! I love the beautiful sailboat scene and you've showcased it perfectly!! The layers are fabulous!! The texture you added is amazing!! The butterflies are so beautiful and I love how the sentiments sparkles!! This is stunning my sweet friend!! I absolutely adore it!! Thank you so much for sharing it with us at DL.ART!! This is just lovely Sherrie! The color combination is perfect! Oh WOW! This is right up my alley and so freaking gorgeous!!!! I LOVE anything nautical or beachy! The image is just perfect and all the different textures and elements that you brought together to make this masterpiece is just perfect! What a gorgeous keepsake! I wouldn't even want to give this away... this would be on display in my home.... especially since I live down at the beach! I LOVE it!!! Oh WOW Sherrie.. this is stunning! I LOVE the design and the different textures you added... the butterflies & Image are perfect! Fantastic! :) Have a wonderful weekend! Oh my, my, my...this is amazing! 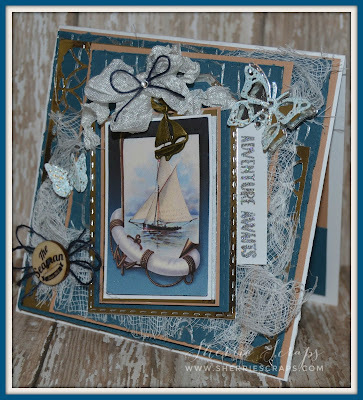 I love all the wonderful layers and textures you have going on with this fabulous card. It really is wonderful! Hope you have a great weekend my friend! Congrats on your win my friend! !I saw it on FB and WOW!! really stunning!! 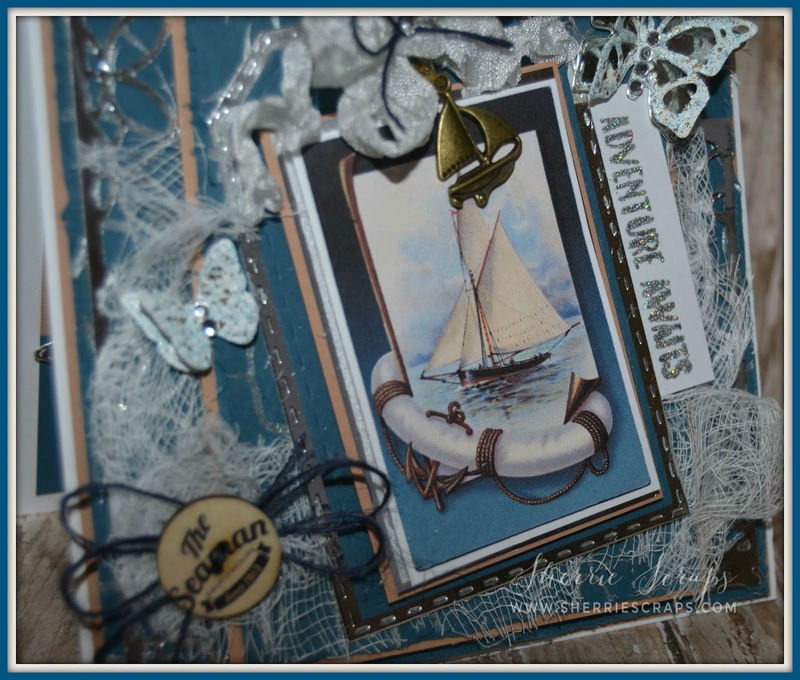 I love the vintage look!The image is simply beautiful.I absolutely love all of the fun and crafty goodies you sued to accomplish that beautiful scene.Awesome job on the crackling textures and using the cheesecloth..Super cool detail! I absolutely LOVE this!! BEAUTIFUL! You know it would make such a beautiful mini album cover too! Lovely card. Love the way you used the cheesecloth. Thanks for joining us for the "By the Sea" challenge at Frilly and Funkie. Very pretty card! So many amazing details you have added! The sparkly butterflies are one of my favorite embellishments on your card! Hope you are having a lovely Sunday! Congrats! So well deserved! Your card is gorgeous Sherrie! Love all the layers and mix of pretty papers! Beautiful Sherrie, I love all the layers and the design is perfect The blues are nice for a guy card. Even with all the frilly stuff. I love it. 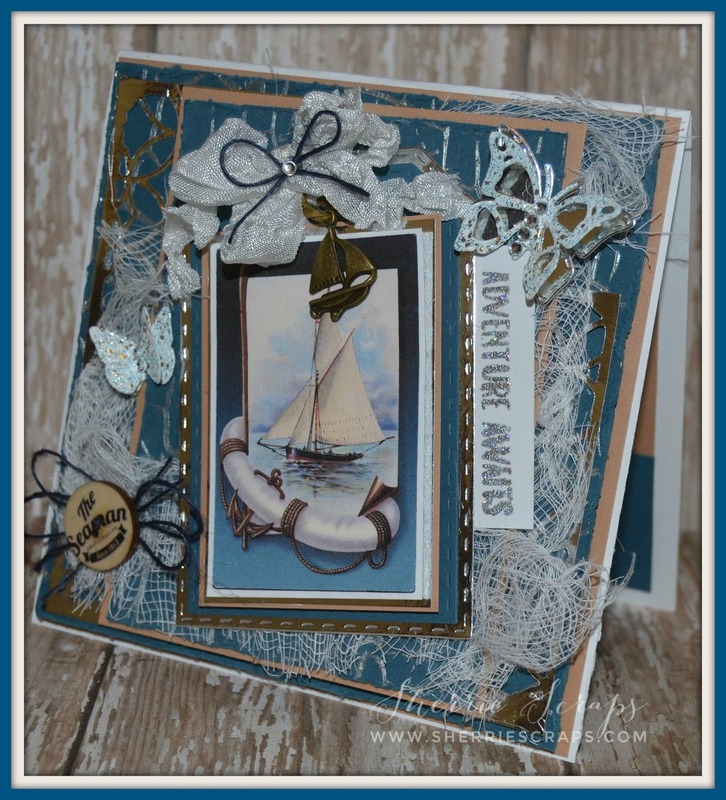 Fabulous seaside card with a lovely colour palette for the theme. 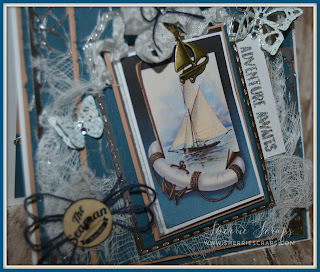 Love the vintage image with the little sailboat charm. Thanks for joining us at Frilly and Funkie. Such a great card Sherrie!! What a beautiful card! I just love that image, its gorgeous! The colors you picked are awesome and the texture is terrific! Super awesome card Sherrie. Congrats on your win! What a wonderful surprise to find some extras in your package too! Your card is gorgeous! The elements all work so wonderfully well together! This is just a beautiful card. I love anything beach/nautical!